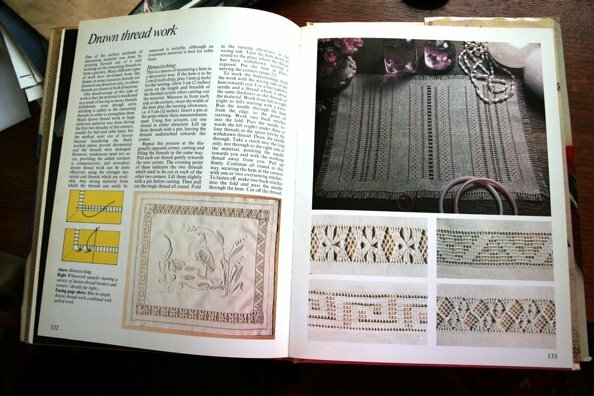 I’ve been enjoying old craft books recently. I picked up a couple in charity shops even thought they are mostly 70s and 80s which are hardly my favourite style decades! I’ve been more open-minded about craft stuff since I started reading so many blogs, so I gave these books a chance and they have been great. Mind you, the stuff I like is the traditional stuff – patchwork and embroidery etc. Not wild on some of the patterns and designs, but technique-wise, they are perfect. The first is Creative Needlecraft, published in 1979 by St Michael (of M&S for British readers!) written by Lynette de Denne. It’s got some real gems in it like needlelace which I am fascinated by – how often do you see that come up? Never? And it has the usual suspects of smocking and quilting but also cutwork and drawn-thread work. Lovely simple diagrams and really useful if you ignore the designs! The second is Julia Foster’s Patchwork, which is just hilarious. From the back page I read that she was an actress in the 60s and 70s so this is a celebrity craft book of the mid 1980s. Oh it’s funny. It’s written in a weirdly chatty way, just sort of rambles about things, funny anecdotes etc. The quilt patterns are all just “well I made it like this and it didn’t really work, so you could try this” with some rather general info about fabrics. It is very bizarre, but inspirational in a few places. One of my favourite bits is this puffy quilt, which she calls baby’s puffs. I like the idea, and will certainly try it some time, but not in beige! and probably not as a quilt, though it is actually quite nice. I’ve put some pics up on Flickr. Anyone else got any old craft gems hiding on the bookshelves? 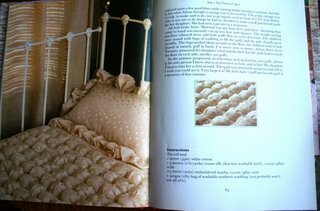 I was really pleased to find someone else into smocking, and not a lot further on than me. I found Moonstitches blog via Whipup where she won a prize for her lovely bag. Great new blog, really enjoying it! Wish I had been more on the ball with WhipLash and the July bag-theme, seeing as I make them all the time, and indeed teach bag-making. I am teaching at the V&A bright and early tomorrow, so best get some sleep first. I adore trashy crafty books – there is nothing so lovelly to the eye – then an old craft book – I crave them when I see them and have a must have moment! Yeah, I am getting very engrossed in them. It’s one of the weird spin-offs from blogging – broader outlook on random craft books!